DANCA REALTY, Inc. Massachusetts Real Estate Our agents make all the difference! 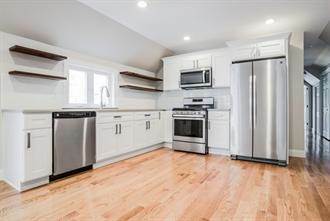 "PRIVATE DECK OFF MASTER BEDROOM"
Luxury Living and Convenient Location in this Top to Bottom Completely Renovated 2 Bedroom 1 Bath Unit with Fully Applianced Kitchen, Master Bedroom with Slider leading to Private Deck and Washer/Dryer Hookups In Unit. High Efficiency Heating and Cooling with separate controls for each room. Located within Minutes Walk of Revere Beach, Buses and Blue Line Train to Boston allowing you to save hundreds per month in downtown parking or apartment living expenses. Available Immediately.